Because as Emperor Ōjin was an ancestor of the Minamoto clan, Hachiman became the tutelary kami (氏神 ujigami) of the Minamoto samurai clan. Minamoto no Yoshiie, upon coming of age at Iwashimizu Shrine in Kyoto, took the name Hachiman Taro Yoshiie and through his military prowess and virtue as a leader, became regarded and respected as the ideal samurai through the ages. Hachimantarō, was a Minamoto clan samurai of the late Heian period, and Chinjufu shogun (Commander-in-chief of the defense of the North). The first son of Minamoto no Yoriyoshi, he proved himself in battle with the Abe clan in the Zenkunen War (Early Nine Years' War) and the Kiyohara clan in the Gosannen War (Later Three Years' War). Subsequently, he became something of a paragon of samurai skill and bravery. ..... The campaign against the Abe clan lasted twelve years (nine, with three years truce). Yoshiie fought alongside his father in most if not every battle. Abe no Yoritoki died in 1057, but his son Abe no Sadato took up command of his father's forces. 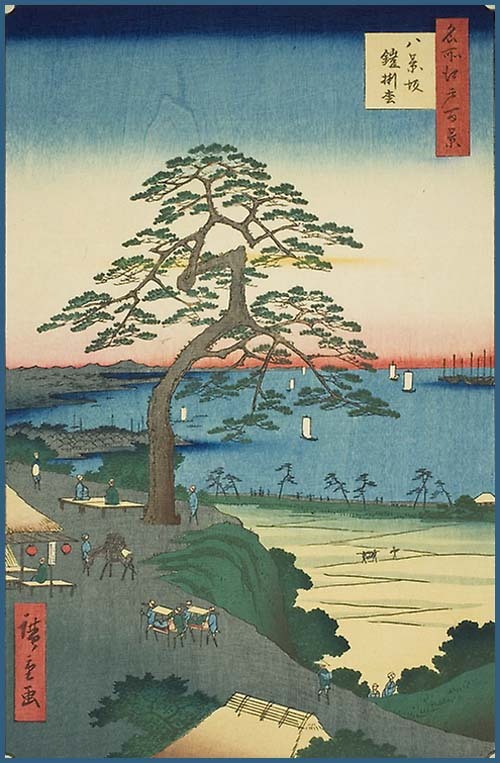 ..... Named Governor of Mutsu province in 1083, Yoshiie took it upon himself, without orders from the Imperial Court, to bring some peace and order to the region. Minamoto Yoshiie, a man who came to embody the spirit of the samurai and a legend even in his own time, was the son of Minamoto Yoriyoshi. Yoriyoshi, the third generation of the Seiwa Genji, was a noted commander, and in 1051 was commissioned to defeat the rebellious Abe family of Dewa. The Abe had for years held prominent posts in this distant, forbidding region, and had come to enjoy a near autonomous existance. Like Taira Masakado, the Abe had been tasked with subduing the northern barbarians, and, from the Court's point of view and over time, become barbarians themselves. Yoriyoshi's chief opponent was Abe Yoritoki, an unscrupulous character who died of an arrow wound in 1057. By this point in the so-called Former Nine-Years War, Yoriyoshi's son Yoshiie had joined the expedition. A promising young warrior, Yoshiie participated in the Battle of Kawasaki (later in 1057) against Yoritoki's heir Sadato. 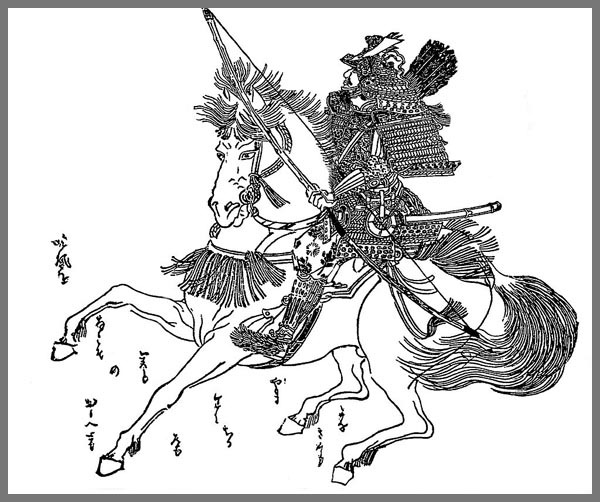 In a snowstorm, the Minamoto assaulted Sadato's stronghold at Kawasaki and were driven back; in the course of the hard-fought retreat Yoshiie distinguished himself and earned the nickname 'Hachimantaro', or 'First son (or First born) of the God of War (Hachiman)'. Abe Sadato comes across as an altogether more impressive man than his father, and proved a formidable foe even for Yoshiie and Yoriyoshi. Yet the Minamoto cause was much assisted by the enlistment of Kiyowara Noritake, a locally powerful figure whose rugged northern men swelled Yoriyoshi's ranks.
. The Heian Period - Court and Clan .
. Hoosenji 宝仙寺 Hosen-Ji .
. Hidaka Jinja 日高神社 Hidaka Shrine .
. Hachimantaro koma tsunagi sakura 八幡太郎駒繋ぎ桜. Ashikaga is "the Land of Beauties". She was a beautiful, gentle woman, protecting her husband 源八幡太郎義家 Minamoto no Yoshiie Hachimantaro, as best as she could.
. Benten, Benzaiten 弁天　弁財天 . Here at this pine 八幡太郎鎧掛けの松 Hachimantaro hanged his armour.
. Legends about Hachiman Shrines 八幡宮　/ 八幡神社 . The SARU of this name does not refere to the monkey, though. Around 1060, when Minamoto no Yoshiie during his war with the Northern Territories passed here, his vassal, 猿藤太 Mashira no Tota , died and his body, clad in full armor, was left in the inlay e 江. His name includes the Chinese character used for monkey, saru 猿. Later the farmers erected a shrine to appease his soul and venerated him as a deity.
. daija 大蛇 huge serpent . The 弁天池 Benten-Ike pond never dries up. Putting a stick into the pond and praying for rain to Yamanokami, then taking home some water from the pond, will certainly lead to a good rainfall soon. In former times there lived a huge serpent in the pond.
. 源義家八幡太郎 Minamoto no Yoshiie Hachimantaro, . (1039 – 1106) built the temple 八幡寺 Hachiman-Ji (Yahata-Ji). Sometimes villagers can see a huge serpent sleeping on the veranda of the temple. If people throw improper unclead things into the pond, there will soon be a strong storm. This shrine is one of the six famous Benten shrines in Edo.